Machining Corporation of America is a full-service machining business that specializes in the production of high-precision, close tolerance components and assemblies for the heavy-duty truck, railroad, and automotive markets. MelCap Partners successfully represented the Debtor in the sale of the business to the most logical strategic buyer in the market. 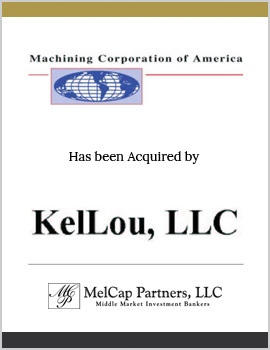 MCA was sold to KelLou, LLC, an affiliate of B&C Machine Company, a leading machining operation, as a part of a plan of reorganization under §363 of the Chapter 11 Bankruptcy Code.